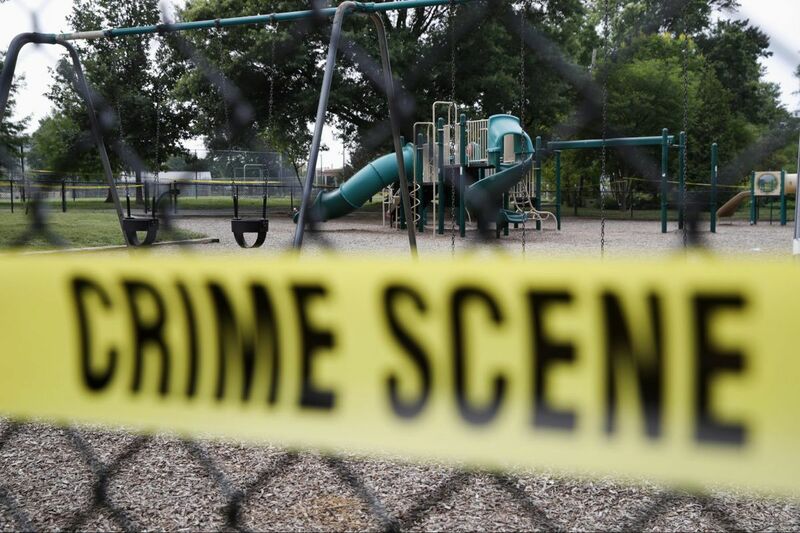 A playground near the baseball field in Alexandria, where last week’s shooting occurred, is cordoned off with police tape. In the wake of last week's shooting in Alexandria, Va., targeting Republican congressmen and their staff on a baseball field, Rep. Mo Brooks (R., Ala.) said: "As with any constitutional provision in the Bill of Rights, there are adverse aspects to each of those rights that we enjoy as people. … And what we just saw here is one of the bad side effects of someone not exercising those rights properly." This is a completely wrong-headed and offensive analysis. When did 92 American lives a day, 33,000 lives a year, become merely a "bad side effect"? When did being gunned down in a church, a movie theater, a first-grade classroom, a baseball field become simply a "bad side effect"? To my mind, never. We did not sign up for this. A small but powerful and well-moneyed gun lobby has tried to pull the wool over our eyes — the equivalent of the fast-talking, small-print recitation of side effects like dizziness, nausea, and hair loss on all those pharmaceutical commercials. But there's a big difference: When I take a drug prescribed by my doctor, I do so aware and willing (if worried) to risk the side effects because of the promised benefit. To call the deaths of innocent people out living their lives a side effect of someone abusing a right is to declare their lives worth less than another person's exercise of that right. That is unacceptable. Somehow, we've become numb to the toll of gun violence and chalk it up as the cost of living in America. We've let the gun lobby elevate its talk of rights above what we know is right. Five people shot is not "a bad side effect of someone not exercising [their] rights properly." It is a direct effect of lax laws that provide easy access to guns to people who should not have them. Forty-nine people dead and 53 injured in a nightclub. Nine killed in a church. Twenty children and six teachers killed in a school. In Philadelphia, more than 140 homicides so far this year. These are not side effects. They are lives lost, dreams destroyed, families with holes in them, missed opportunities. And they are the direct result of allowing easy access to firearms. What keeps me up at night is trying to figure out how to do more, how to bring about the seeming revolution we need so that what is known to all — that we have the right to be safe and to feel safe where and when we work, learn, pray, and play — will actually become reality. We're not fighting a bad side effect. We are fighting a full-on public health crisis. And we know the path to a cure. What keeps me up at night is the worry that, as a nation, we're looking at this all wrong. We need the will to act, and we need leaders with the courage to take action. We must become single-issue voters. The other side is expert at it — they give no quarter. When an elected official dares to vote in a way unacceptable to the gun lobby, he or she is not given a pass. Every time an issue arises, the supporters of the gun lobby make their voices heard — they call, write, email, and visit constantly. We must do the same. And here's the truth — there are more of us. But we can't cling to the idea of being a silent majority. Silence is unacceptable. Inaction is unacceptable. We each have a voice and a vote, and we need to use them. And this is the message we need to send: If you are not part of the solution to the problem of gun violence, you are part of the problem. Gun violence is the disease, not the side effect. We need to dedicate America's talent, resources, genius, and sheer people power to curing this problem.